A somewhat quiet location off of Rue Ontario Est in a part of the Village that is actually more residential, Agrikol is a fairly cozy place, consisting of a bar-like first floor and some additional seating upstairs. And, as a challenge to both the diner and particularly the food photographer, it’s also a leading candidate for Montreal’s darkest restaurant, with the majority of the lighting actually coming from the occasional votive candles on each table (so I apologize in advance for some marginal photography), so at times the dining was practically like Dans le Noir. I do, however, want to come back sometime during the summer months and check out the decor in the daytime. 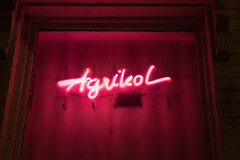 In many ways, Agrikol is more of a bar than a restaurant, with the drink menu (focusing on Rum, as expected) taking up more space on the menu than the relatively compact list of appetizers and mains. 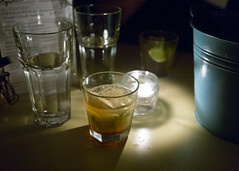 And we certainly rolled with it, opting to get a half-bottle of dark rum served up a Ti Punch, with the waiter bringing out a bucket of ice, glasses, and little carafes of cane juice and lime to make up our individual glasses of punch. I always like a classic Ti Punch, and here it didn’t disappoint. But don’t let the brief menu fool you, either. In addition to the half dozen standard items, they also have several daily kitchen specials, and the items on the dinner menu are quite good. After looking things over, we decided to get several dishes for the table: a goat dish (one of the specials), Coquelet et Legumes (Cornish hen, also a special), and the Mais Moulu (on the menu, a cake of polenta topped with braised short rib). And while waiting for these dishes, we ordered some bananes pesées (plantains). Well-crisped and cooked almost identically to Cuban tostones, there were two notable changes over the Cuban version: the plantains themselves were richly seasons with some sort of peppery spice, and then on the table were several jar of pikliz: the Haitian condiment of pickled cabbage and shallots with Scotch bonnet peppers. The combination of the crispy plaintain with the excellent, spicy pikliz made for a perfect little appetizer. The main courses arrived, and didn’t disappoint, either. 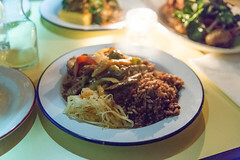 Probably the star of the evening was the goat: several large slices of goat meat in a slightly fruity and peppery sauce served on a bed of rice and peas, this was a delicious dish; the goat was very tender, well-complemented by the sauce, and almost smoky in flavor. I’d happily get this dish again. Probably the second favorite at the table was the Mais Moulu, which was a perfectly-executed fried cake of creamy polenta topped with some braised short rib. The meat was quite flavorful and tender to the point of being little shreds of meet, in a moderately spicy sauce that, combined with bits of the polenta, make for a savory treat. 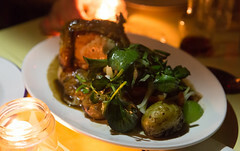 Finally, there was the Coquelet, served up nicely crisped in a delicious, extremely garlicky reduction sauce. While a bit difficult to negotiate in the near-darkness (the phrase “I poked that with my fork and it feels like there’s still meat on the bones” was actually uttered), this too was a dish where the tender meat, the rice, the sauce, and the absolutely perfectly-done potatoes all combined in little packets of deliciousness. Overall, I have to say, for a meal whose main goal was “not filling up”, this was a delicious little outing. I’ll have to make it a point to go back and try some other dishes.